Supermarket chain Kwik Save has gone into administration. The company, which used to be owned by Somerfield, will close 90 stores, with another 56 due to be rebranded as Fresh Express stores. Staff at the reprieved stores should receive their back pay next week, but the 1,100 made redundant are unlikely to be paid by administrators, KPMG. Many staff worked unpaid for the last six weeks in the hope that the chain could be saved from administration. One worker said she and her colleagues had been let down by management and treated "like numbers". 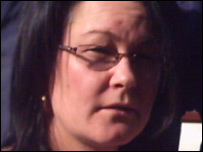 "I am going to fight for my redundancy money," Amanda Higgins, from Liverpool, told the BBC. "I am not going to let it lie." Kwik Save had already closed 81 of its branches as it struggled to compete with low-cost rivals such as Aldi and Lidl and its market share fell to 0.2%. Shop workers' union Usdaw said that staff in stores earmarked for closure would be "devastated" by the news. 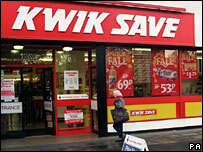 "Our members will be feeling totally let down by Kwik Save," Joanne McGuinness, the union's national officer said. I asked, "Are you shutting us down?" to which she replied "Yes", nearly in tears. "They have shown incredible strength and resilience in trying to keep the company alive and have had to rely on handouts from relatives. Some have faced losing their homes." Redundant staff will probably have to apply to the government to receive some of the money they are owed, although they would probably only be able to claim up to £240 a week. The future of Kwik Save has been uncertain since it was sold by Somerfield group to BTTF 12 weeks ago. In the 12 weeks to 20 May, Kwik Save had just a 0.2% share of the UK supermarket spend, according to TNS Worldpanel, against 0.8% in the same period a year before.